View the Reunion invitation booklet. The Reunion I Final Program will be available in late April. The Reunion II Final Program will be available in late April. 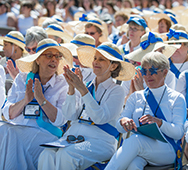 At Reunion, you will enjoy celebrating your lives, the power of Smith College and the remarkable ways in which Smith alumnae are making a difference in the world today. You’ll laugh, share, reconnect and remember. And you’ll once again experience the intellectual excitement that makes Smith the world’s foremost college for women. Join your Smith classmates and friends on campus in May for one of the best parties of the year. To ensure that you receive all Reunion communication from the College and from your Class, verify your email and mailing addresses in the Online Community. If you’ve never logged into the community, click on “Forgot your password?” to look up your username and send yourself a password reset email. You can update your contact information in the community under the “Profile” tab, or you can email your updates to alumnaerecords@smith.edu. Include your name and class year. This mandatory fee helps the college defray the costs associated with Reunion. This fee is waived for guests and children. This mandatory fee, set by your class Reunion committee, helps the class fund the cost of its Reunion program. Charged to alumnae only. On-campus housing details are available here. Register for meals when you complete your online registration form. Vegetarian, vegan, and gluten-free alternatives, as well as special dietary needs, will be addressed on an individual basis and can be indicated as part of the Reunion registration process. Meals for children 12 and under are available for $11 per meal. A late fee of $10 per adult, per meal will apply after the April 26 registration deadline. Meal reservations will be accepted after April 26 on a space- and meal-available basis only. *Some classes have open bars during social hours, while others have cash bar. Please refer to the full menus here for details. Classes of ’39, ’44, and ’49 are guests of the college. All refund requests will be reviewed and processed following the completion of Reunion II weekend (May 26). Please allow up to four weeks after Reunion II weekend for receipt of your refund. Watch for news from your own class Reunion team about the exciting programming they have planned on your class website or Social Media network. If you are on campus for Reunion, please contact the Office of Alumnae Relations as far in advance as possible of any need for specific accommodation such as accessible housing, sign language interpreters, transportation or special dietary needs. Events that are open to the public are regularly scheduled in wheelchair accessible locations to the greatest extent possible. Please be advised that the Office of Disability Services does not have wheelchairs available for loan. If you or a guest is in need of a wheelchair or other medical equipment, please contact Hometown Medical at 413-320-4665 well in advance to ensure availability. Over 1,752 alumnae attended Reunion 2018.